Every week, I go to my Greenmarket with a $20. I could easily spend more, but my desire for buying things like leafy greens often outpaces my desire to cook said leafy greens in a timely manner. So, I set a $20 spending cap to feel slightly less bad when I’m throwing out slimy, wilted food. Despite their name, Millport Dairy are my go-to egg folks. They’re pretty standard pastured farm-raised eggs, which is to say, lovely; incredibly fresh, with thick whites and amazing, lurid yolks. We’ve been going through a dozen a week — especially impressive for a family that often lets lesser eggs sit around until they go bad — so $4 a week is always earmarked for their eggs. A couple weeks ago, I hadn’t been cooking much and still had almost an entire dozen eggs in the fridge. 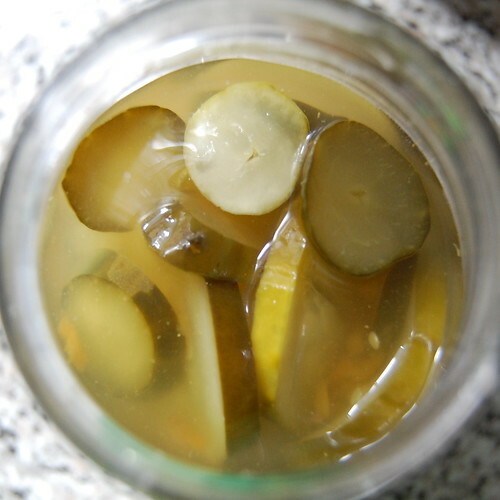 Determined to spend my entire $20, I took the $4 for eggs and picked up a jar of Millport Dairy’s bread and butter pickles instead (again, still not a dairy product). I was a little put off by $4 for a pint jar of plain old pickles, but I figured it’s still cheaper than Rick’s Picks which are $7 or more a jar (although to be fair, they are really quite good). I can’t even describe how much restraint it takes for me to not just stand in the open fridge door and scarf these pickles straight out of the jar. 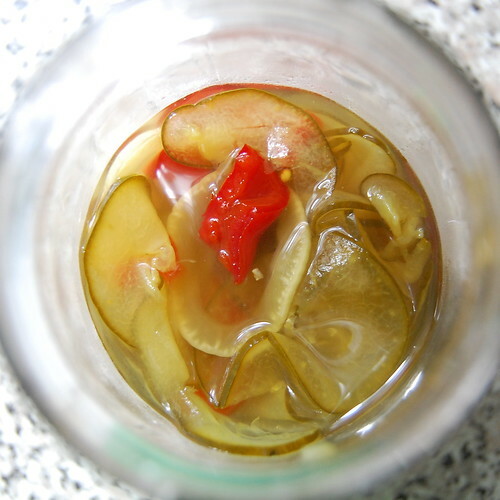 As you can see, they’re sliced paper thin, with bits of onion and sweet red pepper, making them a bit more condiment than regular pickle, but they’re a perfect blend of sweet and sour and just the right amount of crunch. Naturally, I went back the next week and bought more — habonero dill this time. I’m on the fence about these. Eaten on their own, they’re crisp, slightly sweet but more sour, and OH SWEET FANCY JESUS MY MOUTH IS ON FIRE AAAAAARGH. I’m not a spicy food sissy, but these are hot. Hot hot. They were quite good tucked under a cheeseburger but I don’t know what else I can do with these beside eat them until my lips swell up. 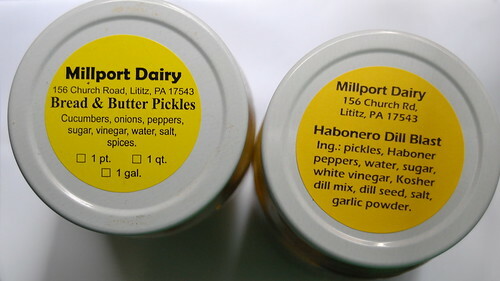 Millport Dairy also sells cheeses, some meat products, and another six or seven different kinds of pickles (including beets, which are my favorite), so it’s pretty safe to assume you’ll be hearing more about them before Greenmarket season is over. Oh hey, Lititz, PA – I was just there this weekend! Man, I’m such a pickle fiend! These both look so good and I’d suffer my lips for a bite of that habonero dill. Wow, I really really must get myself to NYC sometime. Lola: Where IS Lititz anyway? I was picturing, well, the middle of nowhere, honestly. Yeah, it pretty much is the middle of nowhere. It’s about 20 minutes north of the city of Lancaster, in Lancaster County (AKA “Amish Country”). Lots of farms, rolling hills, etc. Very interesting review. I like the rapport you establish with the pickles, imparting their character and other senses that help to transmit the pickle experience. Our household favorite is Gedney’s Norwegian Dills, with jalapeno but not enough for someone outside of Minnesota to notice, I don’t think. But I could kill a jar without even pulling up a chair. Millport Dairy also makes insanely delicious whoopie pies. I’m addicted to the pumpkin ones. I’m delighted with this new stall (to me) here at the Brooklyn Borough Hall Greenmarket. A few weeks ago they had Lebanon bologna, a favorite from my Philadelphia youth, and I liked a horseradish and a smoked cheese. Recently I’ve enjoyed smoked pork shops, a sweet bologna and a jar of spicy hot, stuffed (w/ sauerkraut) pickled peppers (they have sweet as well). Today I bought dried beef, smoked bacon and a jar of “Dynamite Dill Pickles” w/ jalapeño peppers (insistent, but not too hot). Thanks for the good report on the eggs (next time) and I like your idea about only bringing $20 — smart. Another stall had fabulous spinach and v/ large scallions — Salads tonight! I tried the sweet bologna too! It was… something. Not bad, exactly. Just not for me, I think.